Can you really homeschool for FREE?? And if so, where can I find a math curriculum for free, that isn't a century old? My response: Sometimes you have to trade your time for money and sometimes you can find freebies all over the internet. 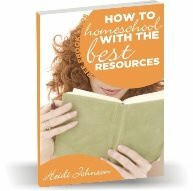 Here are some homeschool freebies listed on my site. You should be able to follow the math resources there. Some of the ways that I have been able to homeschool for free (or almost free) is to purchase books or resources used and then resell them for almost (and sometimes more) than what I purchased them for. This requires a little bit of an investment at first. Other ways to homeschool for free is to spend some time making up your own worksheets or find them on the internet. I have found lots of unexpected finds at garage sales, thrift stores and freebies from other people. If you keep your eyes open wide, you will be amazed at how God can bless you.